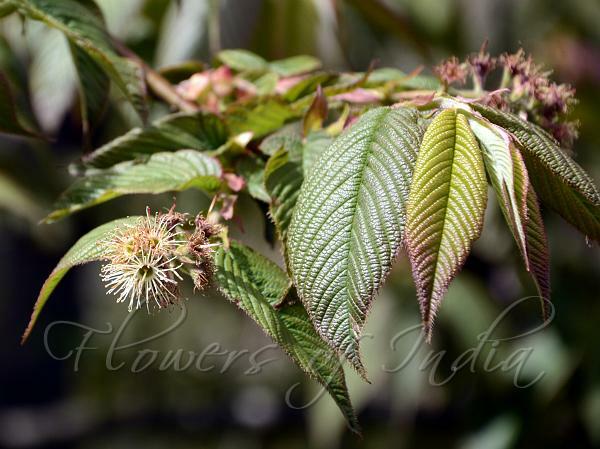 Himalayan Madden-Cherry is a shrub or tree 1-10 m tall, twigs thinly or densely brown woolly, inner bud scales ovate-elliptic up to 1.5 x 0.7cm. Leaves are ovate or elliptic, 4-12 x 2-5cm, tapering, base rounded or shallowly heart-shaped, margins pectinately sawtoothed, teeth capitate-glandular in lower half, veins 12-15 pairs, hairless or densely brown velvet-hairy on veins beneath, nearly stalkless or leaf-stalks up to 5mm; stipules oblong-lanceshaped 1.5-2 x 0.2-0.5cm. Flowers are borne in racemes 10-20-flowered, receptacular cup 4-5mm, green tinged crimson. Sepals and petals are narrowly lanceshaped, small, 3-4 x 0.75-1 mm, velvet-hairy. Stamens are cream-coloured 5-8 mm. Ovary and style hairless, 7-10 mm. Drupes are ellipsoid, 8-10 x 6-8 mm, crimson. 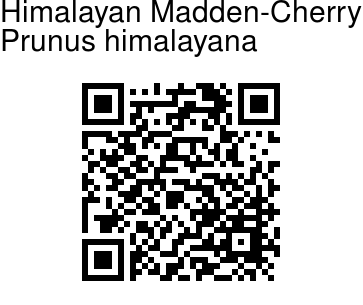 Himalayan Madden-Cherry is found in NE India, Bhutan, Nepal, at altitudes of 2800-4200 m. Flowering: April-May. Identification credit: Siddarth Machado Photographed in Tawang, Arunachal Pradesh.